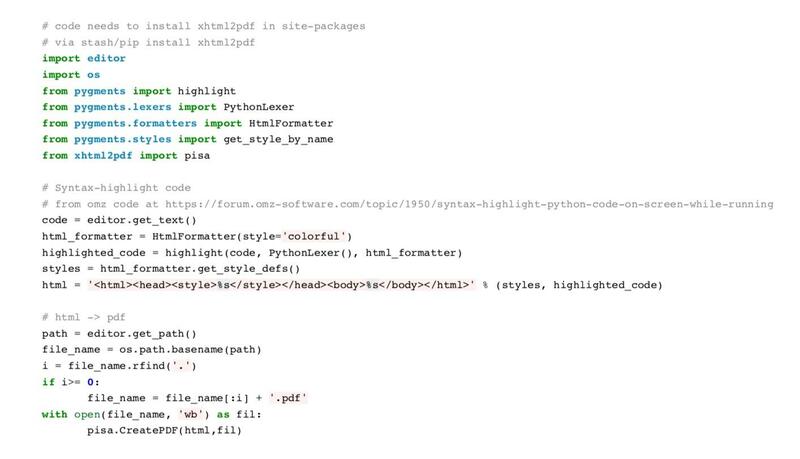 Ireally need to know how can I export in PDF the code and the output of a program in Pythonista. I’m having this programming class where the professor asked for us to send only the .pdf files containing the solution of the exercises + the code that we wrote. It’s as simple as it sounds and still I’m so mad I didn’t figure it out, sorry.. I searched in quite a lot of topics but couldn’t find anywhere, only that maybe has something to do with Py2PDF on Pythonista. @cvp, dependecy on PyQt seems problematic? Looks like @ccc could comment, listed as contributor. @cvp, but aren’t we making this unnecessarily difficult? In Apple Shortcuts, there is a Create PDF action, and the Gallery includes a ready-made script for that (select the margins switch to make it look nicer). When viewing the code in Pythonista, select wrench, Share, Shortcuts and pick this Shortcut - done. Something fancy could be created to automate this for a large number of files and their outputs, but for the OP issue, probably enough? @cvp, added an API call to hilite.me service to the Shortcut and got this (with line numbering included). Note the professor wants both code AND program output. I imagine also that he might expect some kind of header/format? @JonB Agree, but passing via html helps for other infos like headers..., isn'it. @cvp, I agree that an all-Pythonista solution would be nicer and provide more opportunities to handle several files with a single click. Anyway, here’s the shortcut. @mikael Thanks a lot. I didn't even know this feature of posting to an API in Shortcuts app. @cvp, easier to redirect all output to a file? @mikael Sure but needs to change the code? @mikael I didn't know this functionality. Anyway, this is a shorter and general solution.